My c.1800 gown for What Cheer Day on October 5th is progressing, but I'm stuck! I've drafted my pattern, which is modeled after the Augusta Auctions gown below, and sewn the bodice / skirt together. The sleeves, which are rather baggy, are ready to be set...but I'm not quite certain about my interpretation. ...yet I'm not sure if this is technically correct. When I try on my sleeve it feels so weird to wear something so loose. It's impossible to know how these gowns fit the ladies who wore them or if these gappy sleeves were a later change when the "mutton" sleeve was popular. 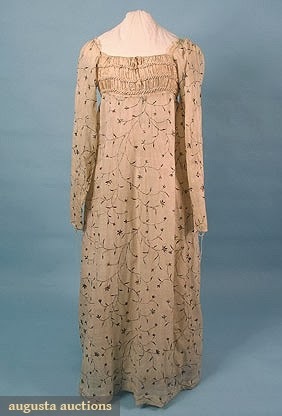 To gain a better understanding of how my c.1800 sleeve should fit, I've researched portraits/prints of women wearing long sleeved transition gowns (many of which are pinned in my c.1800 Pinterest board) and I haven't found one that shows the sleeve looking quite as baggy as I'm assuming these sleeves are. In fact, they look rather fitted. 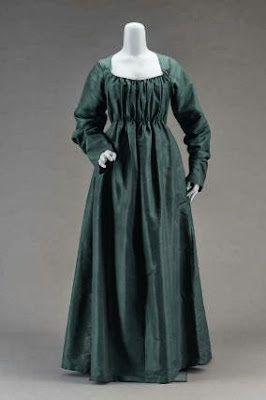 Do I set in the long sleeve that I've prepared--which is less baggy than the green MFA gown but more baggy than the embroidered white day dress--and add a dart at the elbow to make it fit more like the extant portraits? Or do I toss the long sleeve and go for a shorter, fitted 3/4 length sleeve? 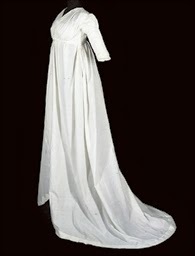 I'm thinking it would be less baggy than the sleeve on my c.1795 gown and more like the example from Christie's? Seems to me most sleeves fit more tightly than the baggy ones you've found. On the other hand, some room for movement (you are a nursemaid after all) would probably be reasonable and smart. I'm not sure what you mean by an elbow dart, but it sounds a bit odd... and will it really fix the problem of too much fullness from the full length of armpit to wrist? Perhaps you can cut a slimmer sleeve out of the sleeve you currently have? Hi Quinn, Yes that's what I meant...taking the fabric in and adding some sort of dart to make it more fitted. Thanks for your insight! I don't know if this is any help, but I made a long sleeved 1790's gown with long sleeves a couple of years ago. The top of the sleeve was quite baggy, but the sleeves was not set in the armhole in the back, but several cm in. Giving an impression of a more narrow back. It was a two-piece sleeve. Thanks for sharing the links! I hadn't thought about cutting the sleeve down into two parts but I could certainly try that to make it more fitted. My scanner doesn't like me at the moment, but I could take a picture of the patterns if that would be helpful. How sweet of you, thanks for offering! I think I'm going to go with a 3/4 length sleeve for this project since it's documented and the event is less than two weeks away. I'm hoping to experiment with a long fitted sleeve later this fall so if you wouldn't mind sharing an image when you have a minute I would appreciate it! No problem at all. :) What email would you prefer that I send the picture to? 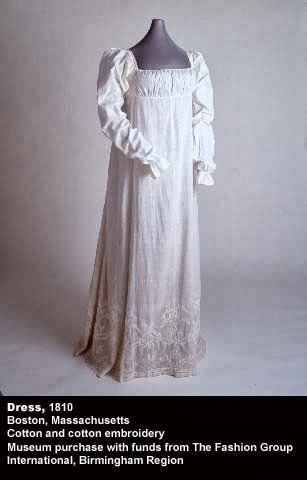 I'm not certain about it being period correct, but when making gowns of 1800 - 1812 styles for ballet, a sleeve lining that it more fitted, narrower and of the appropriate length is made and the outer, fuller sleeve is mounted on that. This will allow the fullness at the top to fall attractively, and the extra length to be more evenly distributed.